Beloved and I had a late lunch at UNANI Yakitori + Sushi a couple of weeks ago. I’m expediting this review despite having a couple of new places in the backlog for reasons I’ll explain in the last paragraph. Anyway, we’ve always passed by this place, located at what I’d like to call the “dead zone” of popular foodie street Maginhawa of UP Teacher’s village. I call it such because it seems aside from Papa Diddi’s, all other restaurants and even food parks seem to struggle in this place and close down within their first couple of years of service. The reason we haven’t tried this place is because it seems deserted each time we pass by. Also, we’re also usually always already filled up when we do pass by this place, only having room for dessert in nearby Papa Diddi’s. We made it a conscious effort to actually try this place out after some of our friends asking if this place is good the last time we went to Maginhawa, and not having an answer. The place was empty (literally) the first time we went. We had to call for the server who was in the back after finding the menu. It offered, as expected, yakitori, or grilled chicken, and sushi. 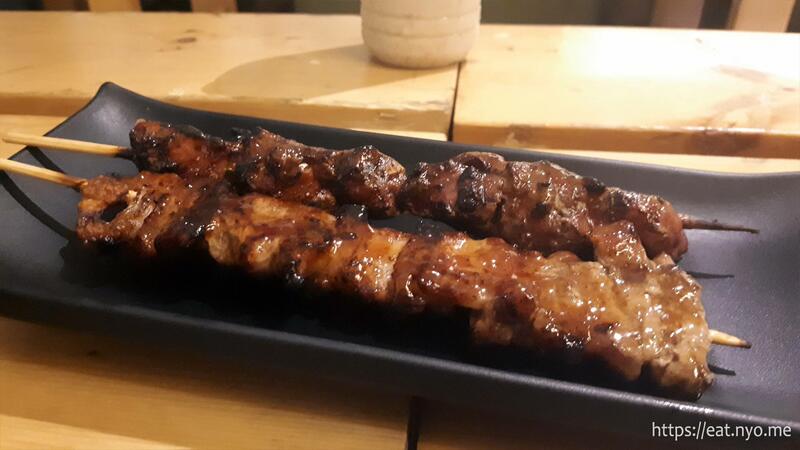 Actually, it’s more than grilled chicken, there’s other grilled meat skewers too—pork and beef specifically. They also have other Japanese dishes like tempura and misono. 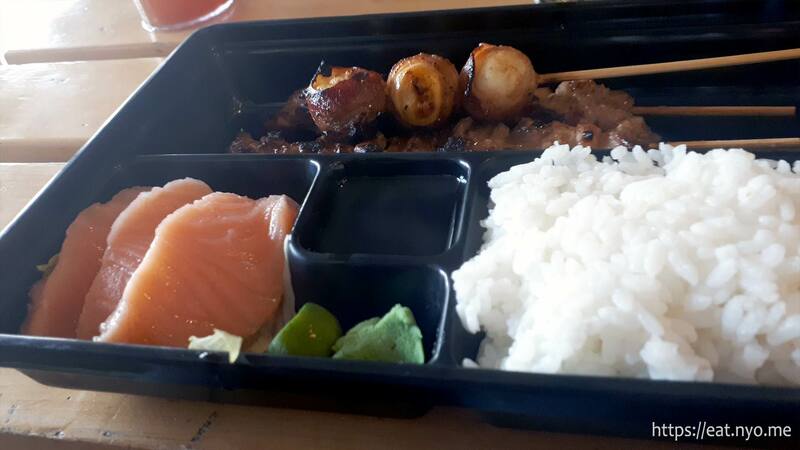 While their skewered choices were available on a per-stick basis, what caught our eyes was their bento, which comes with rice, miso soup, iced tea, and our choice of either salmon, tuna, tamago, or kani sashimi in five different variants. 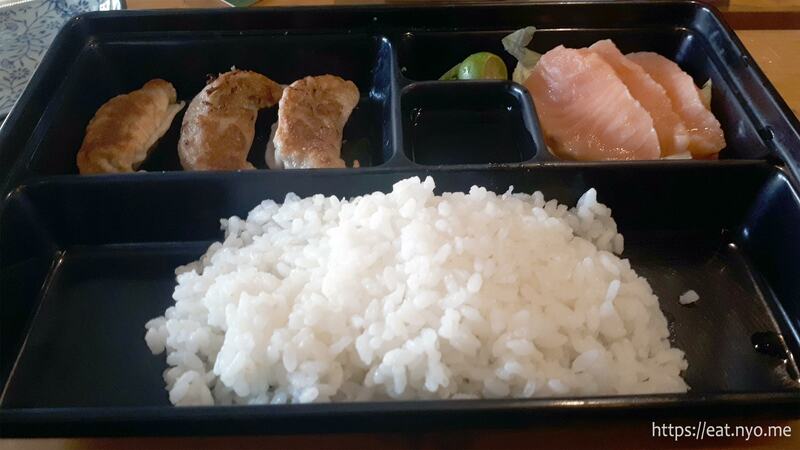 Since we were in a bit of a budget, we opted for their more economical choices—their Pork Bento (275 Php) for me and Gyoza Bento (270 Php) for Beloved, both with salmon sashimi. Their Pork Bento consisted of two butabara or pork belly slices and quail eggs wrapped in bacon, along with our choice sashimi. The butabara was amazing—it had charred parts and juicy parts, giving it a delightful mouthfeel. I enjoyed it more than the bacon-wrapped quail eggs, which were also quite good, with the bacon crisp on the edges yet still a bit chewy at the middle. While the sashimi wasn’t the best we’ve had, it was okay. Their Gyoza Bento had three pieces of gyoza, or Japanese dumplings. It was quite usual, with ground up meat, maybe pork and shrimp, in the signature steamed-on-one-side-and-pan-fried-on-the-other way of cooking gyoza. It was not really the best we’ve had, but they were okay and actually quite sizable—enough to be called a meal. Still, I’d stick with the yakitori bentos next time. 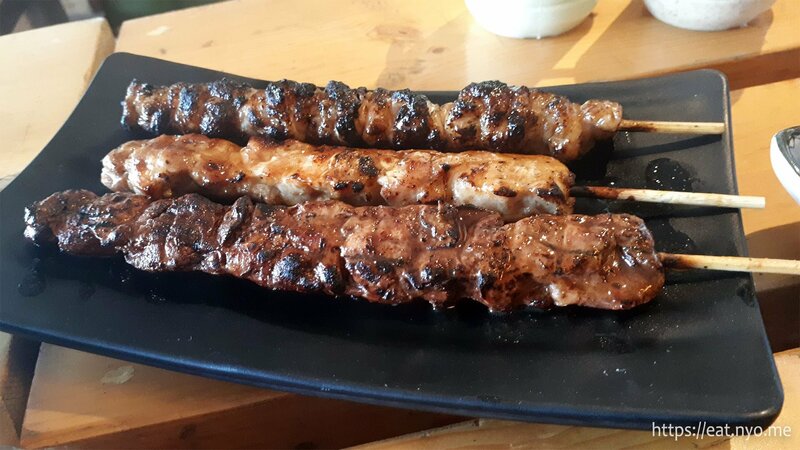 Since we enjoyed their skewers, we decided to order some of their actual yakitori, specifically their Skin (35 Php), Thigh (45 Php), and Liver (35 Php), shown from top to bottom. The chicken skin was very nice—not crispy, but definitely fatty and had a lot of delicious chicken juice. The thigh didn’t have the skin on, perhaps used in the previous stick, so it’s not as juicy-fatty as what we’re used to, but it was still quite nice and tender. The liver I’m not a fan of, mostly because of the expected gritty texture, but I’m not really fond of liver in general. Beloved enjoyed the liver as much as I enjoyed the chicken skin. Since I enjoy the smoky taste of grilled dishes, I had no complaints taste-wise for all of our food. However, you can optionally use their sauces—Wasabi Lime or Roasted Sesame Leeks favors. They very much taste what is written, with the former flavor (wasabi, roasted sesame) overpowering the hint of the latter one (lime, leeks). We went back here for dinner a couple of weeks later. It was still deserted customer-wise, but at least there were staff attending to us this time. This time, we ordered two other bentos that we haven’t yet: Beef Bento (360 Php) for me and Chicken Bento (275 Php) for Beloved. 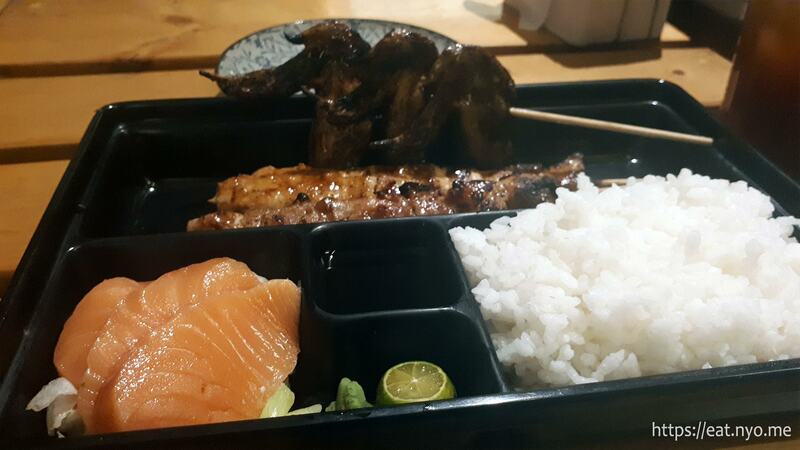 We also got a couple of their yakitori that we already know we like—Liver (35 Php) and Butabara (45 Php). 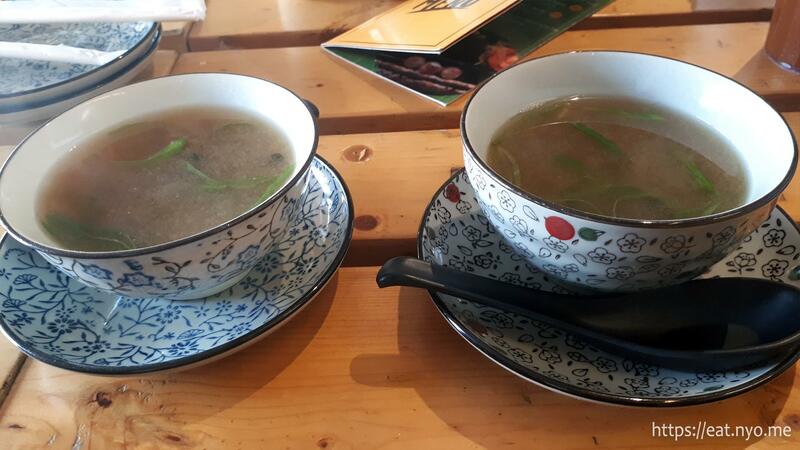 I forgot to talk about the miso soup that came with our bentos. It similarly arrived before our main course. What I’d like to higlight is there’s some unusual greens here, some sort of seaweed that’s not dried. It’s quite good, actually, and a pleasant preface to our meal. Their Beef Bento had two sticks of U.S. Beef Ribs and one of U.S. Hanging Tender. The former was essentially beef barbecue—get the butabara and replace it with beef. The “U.S.” didn’t really do much, but it was still quite nice and tender. The latter were cubes that, while not melt-in-your-mouth delicious, was much more soft than the ribs. While nice overall, I’d stick to the pork bento for the better value and flavor. Their Chicken Bento was the most varied, having three different chicken parts: thigh, cutlet, and wings. The thigh, we already ordered before, so I’ll skip that. The wings were perhaps the best value stick here, but Beloved doesn’t like chicken wings, so it all went to me. Finally, the cutlet was perhaps the best cut for us and can be compared to the butabara or beef ribs, essentially your “default” chicken skewer. Honestly, a normal person will get full already with their bentos, especially with the amount of rice included. Unfortunately, we weren’t quite normal stomach-wise. We really needed their Butabara and Liver skewers not just for the flavor, but also for getting slightly more full. They still tasted as deliciously consistent as our previous order. 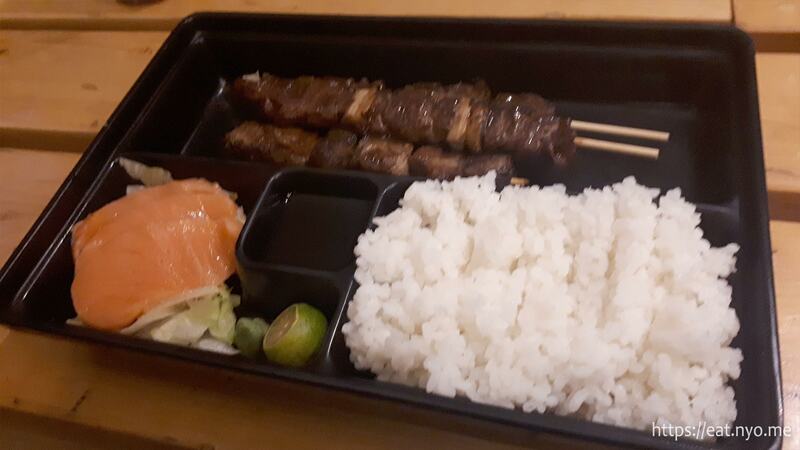 While we didn’t have any sushi, I can definitely recommend UNANI Yakitori + Sushi for their bentos which do feature their yakitori. Now, the reason I’m giving this priority over the others that I have in the back-burner is because I don’t want to see this place close down like the other places I’ve seen that died out in Maginhawa’s “dead zone”. This place definitely deserves to stay. It’s decent value, good food, and what Beloved and I agree can be called “Nanbantei lite”. This place can easily sate my grilled/barbecue cravings minus the premium I’d be paying for in the aforementioned comparison. Really, the only flaw is that I feel there’s not enough customers here, maybe because nobody knows about this place or it does poor marketing. 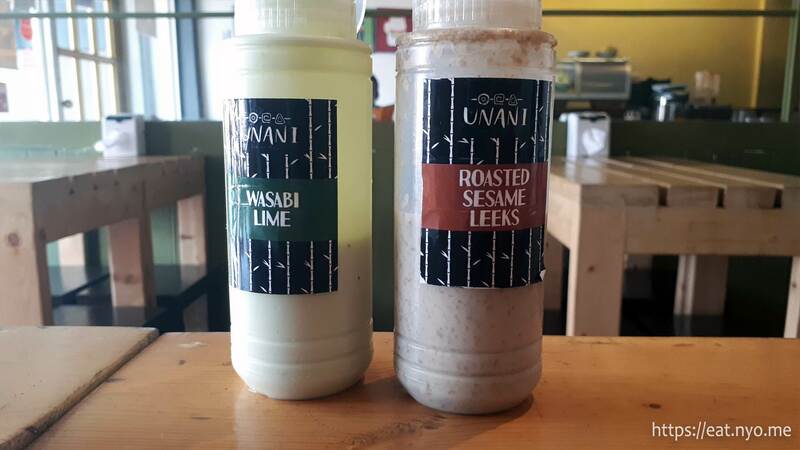 Well, this piece is free marketing for UNANI—it’s definitely worth the two tries we’ve had and hopefully more in the future. Smart nomnomnom tip: Take advantage of their bentos.